Why Does Bibi Stand up to Iran at the UN and Give in to Iran in Judea and Samaria? Two days before Israeli Prime Minister Benyamin Netanyahu flew to the UN to fight the lethal challenge posed by Iran, Netanyahu’s Defense Minister, Ehud Barak, announced that he favored a massive Israeli unilateral withdrawal from most of Judea and Samaria. Our agency sent an SMS to the spokesman of Netanyahu to ask if the Barak retreat plan was in coordination with the Israeli head of state. Bibi’s office would not respond. No response is a response. However, what Israel learned from its retreat from Gaza and from Lebanon is that any area abandoned by Israel would come under the lethal control of Iran. Yet Barak’s seemingly new policy is in keeping with Israeli government policy decisions that were taken more than seven years ago. In March 2005, speaking about the dangers of the plan to withdraw the IDF from the Gaza Strip and part of northern Samaria, then-deputy minister of immigrant absorption Yuli Edelstein warned that the February 20, 2005, government retreat decision applied not only to Gush Katif and four small Jewish communities in Samaria. Rather, Edelstein emphasized, the decision applied to redrawing areas of Jewish residency in almost all the territories that Israel acquired in the aftermath of the 1967 war. 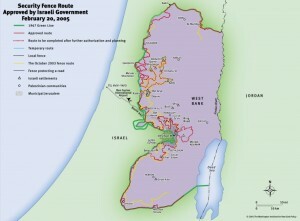 At the time, a map of the government withdrawal plan which was to be based on the path of Israel’s Security Fence according to Edelstein, was made available by the Washington Institute for Near East Policy, and is posted there to this day for all American government officials to peruse. That map, which includes plans for the destruction of 63 Jewish communities and the eviction of thousands more Jews from their homes throughout Samaria, Judea, Hebron and the Jordan Valley, has never been posted or discussed in the Israeli public domain – not in the media, not by the Knesset and not even by the current Israeli government. Hardly anyone is Israel has viewed the map that was approved seven years ago. The move to downplay the full extent of the retreat plans from the public was made after senior advisers to former prime minister Ariel Sharon assured Judea and Samaria leaders that the Gaza/Northern Samaria pullout plan would not be expanded to include the rest of Judea and Samaria. By obfuscating details of the government-approved retreat map from the Israeli public, Sharon successfully prevented his wider plans from taking center stage on the national debate. Preventing public debate on the map was Sharon’s way to ensure that his plans to “disengage” from Gaza in August 2005 would continue unabated. In 2005, Netanyahu was Israel’s finance minister. He knows the retreat map as well as Barak. All this begs the question: Why does Bibi stand up to Iran at the UN and give in to Iran in Judea and Samaria?